From Friday 26 October 2018 email for active Griffith students is available in Outlook 365. To access go to the Email link in your myGriffith portal and login using your sNumber and password. How do I access Outlook email? The supported method for accessing email online from your laptop or computer is via a web browser. Enter mail.griffithuni.edu.au in your web browser, sign in with your Griffith username ('s' number) and password. Outlook can also be accessed on a mobile device or installed on a PC or Mac. How do I install Office 365 applications on a PC or Mac? Students can download and install Office 365 applications directly from the Microsoft Office 365 Portal. This is the only method available for installing on personal / home computers. 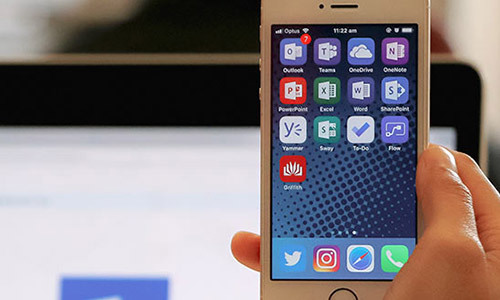 How do I install Office 365 applications on my mobile device? The official Microsoft apps are the only recommended and secure method of accessing your content on mobile devices. Check out our Productivity Hub. A one-stop-shop for Office 365 resources and self help material. Find out everything you need to know about 365 apps! Need help making Office 365 work for you? Students who have reached their conferral date continue to have access to Office 365 applications including Outlook for email for 180 days. After 180 days access to all applications, except email, will cease. If you have any questions about your office 365 account, you can find your answers at our Productivity Hub 24/7. For assistance setting up access to Office 365 applications from your device, visit a Tech Assist bar on Nathan and Gold Coast campuses.